All these key elements are important – and the members of our Global Community of Practice feel that greater citizen engagement is far and away the most important. 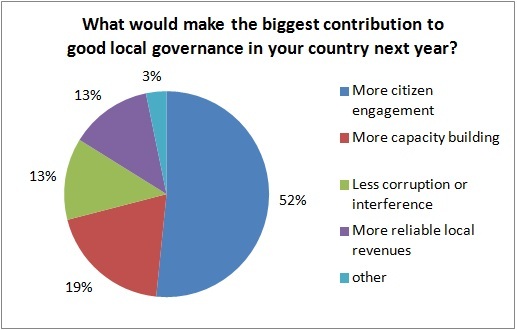 We were surprised to see what a large percentage of the respondents to poll #2 have local governance as a major focus of their work. As you see in results of poll #3, political or bureaucratic obstruction and lack of awareness/information are twin challenges we have to confront. 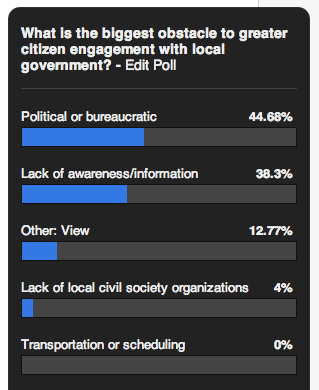 As you see results of poll #4 on best ways to enhance to greater civic engagement, most people say “Go to the People”. 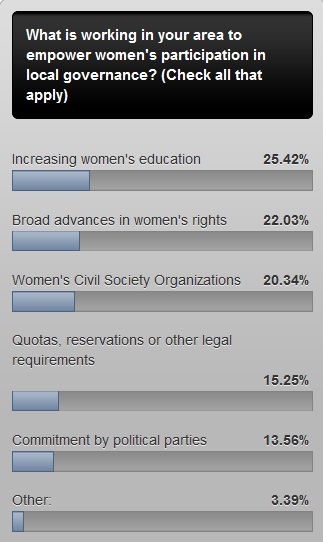 Results of poll #5 mentions every form of empowerment is needed for women’s participation in local governance. 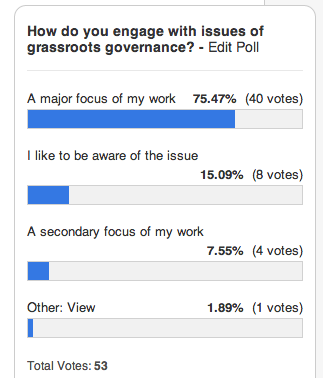 Do you want to ask a question to our members of Community of Practice through a quick poll? Please request from here. February 5, 2014 in Discussion. Quick poll results- What would you like to see on our website? One of the key reason for non-participation of citizens in the process of participatory governance is the insensitivity and inability of the higher levels of Government to respond to the needs and concerns of local governments in a systematic and equitable manner. Especially when local level plans are not regarded at the higher levels of administration and there is a mismatch between allocation and demands. 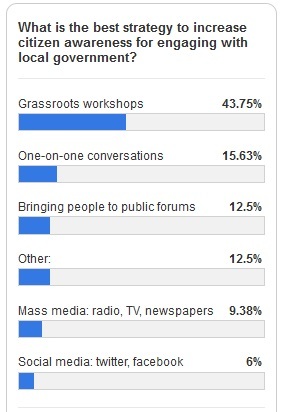 Grassroots workshops needs to be combined with community radio or other local information dissemination mediums. Workshops will provide platform to share ideas and do action planning and local information dissemination tools will maintain the regularity of communication. At the same time a village guide / mentor to update rural communities on latest government programmes is also required.